A brown bear mauling prompted the Coast Guard to rescue two hunters from a mountain near Hoonah and bring them to Juneau Saturday afternoon. Only one of the hunters was injured. Coast Guard Lt. Greg Isbell said the injured hunter explained they were hiking a mountain when the bear ambushed them. “He had described that he had multiple puncture wounds, and the bear had grabbed his leg and bit into his thigh,” Isbell said. Isbell said the bear was a mother with two cubs. One hunter said they had to kill the mother to save their lives. He said the cubs appeared to be about two-years-old. Isbell said after the mother was killed it was still a tense situation. “The hunters had to continue to shoot warning shots at the other two bears to keep them away because they kept trying to close in while they waited (for) transportation,” Isbell said. 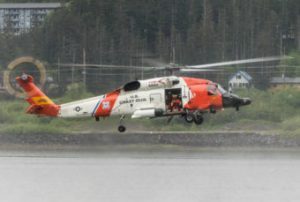 The Coast Guard launched a helicopter from Sitka with a corpsman and rescue swimmer aboard. They brought the hunters to Juneau and the injured hunter was taken to Bartlett Regional Hospital. Isbell did not know the full extent of his injuries.